Mary’s never been completely honest with anyone–especially herself. The man she’s supposed to marry reminds her of her father in ways she’s suppressed for years–controlling, abusive, and manipulative. The sisters she’s finally found don’t understand her shame or confusion. You can follow Bonnie through her facebook, blog, twitter, and/or goodreads. You can purchase Regretting Redemption #4 at amazon, barnes & noble, and/or kobo. 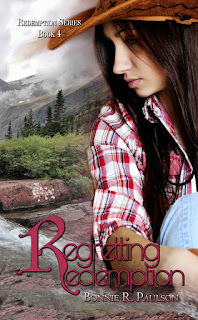 Regretting Redemption book 4, is the fourth book of the Redemption Series. This can be read as a stand alone. I have not read any books from the series previous to this, but I am looking forward to finding more now! This book is a short, but captivating read. Each chapter changes point of view from Mary to Ian. Mary a daughter of a well known gang leader, Ian a British ranch keeper. Both have pasts they would like to leave behind. I usually turn away a western romance, but there was something intriguing about the synopsis. I'm a sucker for a damsel in distress love story. This book did not leave me disappointed. I enjoyed following along Mary's journey of tough revelations. Her father was a wonderful dad, but he was not a wonderful man. He hurt people, and did things she never dreamed of. Meeting Ian, she had no idea a man could treat a lady like gold, only problem was she was set to marry someone who treated her like coal.